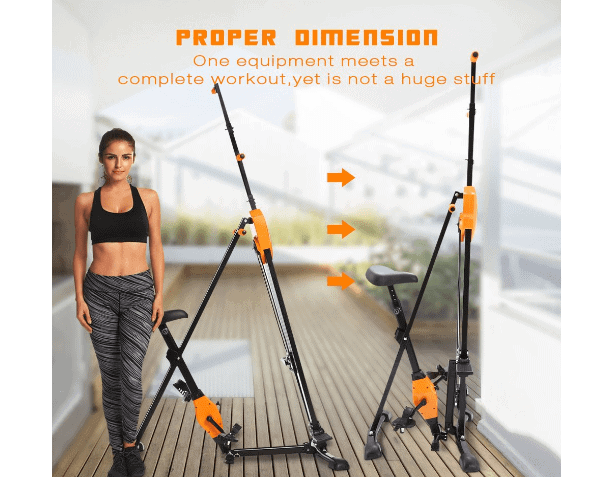 The ANCHEER Vertical Climber 2 in 1 Climbing Machine Stepper is an interesting total body workout equipment that is not only affordable but also offers the opportunity to perform climbing and cycling activities. These features could get almost anyone that wishes to have something affordable for total body cardio exercise interested because it is not common in its category, not even the popular Maxi Climber has that. In other words, you can easily switch from climbing to cycling exercises. The unit is affordable, compact, foldable and lightweight. It weighs about 55.9 pounds/25kg and pretty easy to assemble. It is ideal for home and office use. It is sturdy with a frame made up of steel alloy that supports 220 pounds/100 kg maximum user weight capacity. The climber is adjustable from 80 to 85 inches in height, while the exercise bike seat adjusts from 35.1 to 38.2 inches (from base to seat). It is equipped with a monitor that tracks time, distance, speed, calories, and SCAN. This is suitable for those that would like to experience mountain climbing. The exercise bike has a semblance of the foldable exercise bike but doesn’t have resistance; it is designed mainly for warm-up and not for complete cycling bike workout regimen. Click right here to have a peek at the discounted price of the ANCHEER Vertical Climber 2 in 1 Climbing Machine Stepper on Amazon. The ANCHEER Vertical Climber 2 in 1 Climbing Machine Stepper comes in orange or pink color, you will have the opportunity to choose the preferred color you want on Amazon. Just as aforementioned, the frame is made of steel alloy and coated with anti-corrosive paint that basically preserves and prevent rusts invasion. It is sturdy and supports 220 pounds/100 kg maximum user weight capacity. There are other parts that made of ABS material, such as the covering for the exercise bike drive, the console and the rubber cap on each end of the stabilizer bars. It is totally adjustable; the climber height could be adjusted and the seat of the exercise bike could also be adjusted vertically. This means that it can be used by all members of mounting climbing family regardless of the variant in individual height. It is stable because of its robust base framework that features 3 separate stabilizer bars with a cross adjoining steel bar. No wobbling movement will be experienced as long as you are within the stipulated weight range the equipment supports. There are 2 sets of handles; the static and the moving handles. The static handles allow you to perform certain workouts that impact the lower body only but the moveable handles allow you to perform the total body mountain climbing exercises. The ANCHEER Vertical Climber 2 in 1 Climbing Machine Stepper doesn’t take up too much space when fully assembled and ready to be used and it is also foldable when it is no longer in use. The overall assembled dimensions are 46.4 inches long by 25.7 inches wide by 85.5 inches tall. Differently put, it will require a workout area of 4’ long by 2’2’’ wide and a ceiling height of at least 7-7’5’’ high, depending on your height. You may want to also consider adding an extra clearance of 1 foot on each side of the machine for safety and convenience reasons. The full body workout machine targets the arm, the abs, and the glute muscle groups and generally helps you to burn fat and lose weight. 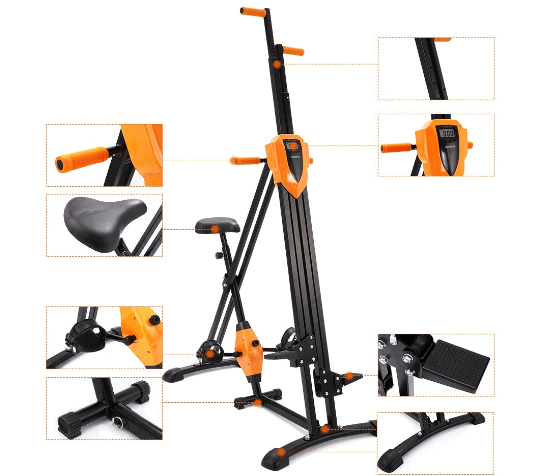 The seat on the ANCHEER Vertical Climber 2 in 1 Climbing Machine Stepper is just like the one a standard foldable bike. It is 2 way adjustable; i.e. vertical (upward and downward) with few adjustment levels. The seat height could be adjusted from 35.1-38.2 inches so that users of different inseam might be accommodated comfortably. It is decently comfortable and besides, it is not meant to be used for a longer workout. Nevertheless, if it is absolutely necessary to improve its comfortability a gel seat cover could be used on it. The adjustment knob is by the right side of the seat, underneath and very easy to use. There are 2 sets of handles, which are the static and the moving set. The static handles are designed to be held when working out with the exercise bike or the climber while the moveable handles are designed for the climber only which also happens to target the entire body. The 2 sets of handles are coated with a sponge-like foam material that provides comfort and a secure grip during workouts. No slippage or blisters will be experienced in the palms no matter how long and intense you train with the climber. Again, the pedals on the exercise bike are the same as the ones on the regular folding upright exercise bike. They are anti-slip designed with adjustable safety straps that secure the feet in place. The footpads are mobile and have an anti-slip design. These are on the climber and are meant to be used while on it. They are interconnected with the moveable handles through durable cables and pulleys. The overall performance of the moveable handles and the footpads are great because they don’t generate disturbing noise/sound while performing the mountain climbing. Thus, you can still watch a TV show with volume at a normal level. The ANCHEER Vertical Climber 2 in 1 Climbing Machine Stepper has an exercise bike hence it has a drive as well. The unit features a belt drive system that consists of a belt, a pulley, crankset, crank arms and a small flywheel. These elements work together to provide a smooth and quiet operation that feels good and doesn’t bother anyone around. Train at your own convenient time or day. Moreover, the drive is maintenance free, no post lubrication or adjustment is required. The exercise bike does not have resistance. In other words, the pedals don’t have any resistance or challenge and neither does the climber equipped with any arm resistance bands. You must know that the bike is basically designed to provide you with the warm-up activity that gets you ready for the mountain climbing exercises. The ANCHEER Vertical Climber 2 in 1 Climbing Machine Stepper is equipped with a basic console that has an LCD monitor on it. The console/monitor cannot be used or viewed while on the exercise bike but while on the vertical climber. The monitor tracks time, distance, speed, calories burned and scan and can be navigated by a single button. The metrics are displayed one at a time after a few seconds and continuously and can also be set to show a static value of your choice. It has good readability but might be compromised when viewed in a room with a poor illumination because it is not backlit. The problem is it will be difficult to view these workout values while performing the mountain climbing exercise due to the fact that the console is ill-positioned. The console is powered by a single battery. There is no accessory available on the ANCHEER Vertical Climber 2 in 1 Climbing Machine Stepper. That said, it is important to have at least a water bottle holder that helps you to keep water handy so that you can stay hydrated throughout the entire workout session. Therefore, you must improvise to keep water within reach during a workout. The ANCHEER Vertical Climber 2 in 1 Climbing Machine Stepper is foldable and takes up a minimal space even though it is 2 in 1 equipment. You can easily adjust it to fold by removing the pin lock that is on one end of the adjoining steel bar at the base. The length will significantly reduce to almost half its size. It doesn’t have transport wheels but it is a lightweight that weighs less than 55.9 pounds/25 kg and can easily be moved by an adult. The ANCHEER Vertical Climber 2 in 1 Climbing Machine Stepper is shipped in a box with dimensions of 59.65 inches long by 12.6 inches wide by 11.42 inches height and weighs 55.9 pounds/25.4 kg. The shipping cost varies depending on the vendor that you are purchasing from; however, Amazon provides free shipping and delivers within days of order placement. The ANCHEER Vertical Climber 2 in 1 Climbing Machine Stepper comes partially preassembled. You are only required to attach the two main cores together and then attach the stabilizers bars, the rails, the handles, the seat, and the pedals to the cores. The instruction manual and the tools required for the assembly are included in the package. The whole process might take about 30 minutes, more or less depending on how quick you are. This 2 in 1 Vertical Climber does not require any special maintenance. Once it is assembled, all you need to do is to make sure that it is examined before use for any loose or broken part that may lead to an accident or further damage to the unit. Finally, ensure to always keep it clean from dirt and sweat before and after use. The ANCHEER Vertical Climber 2 in 1 Climbing Machine Stepper is primarily a vertical climbing machine but it is integrated with an exercise bike that doesn’t have a resistance system to help you perform a warm-up exercise. 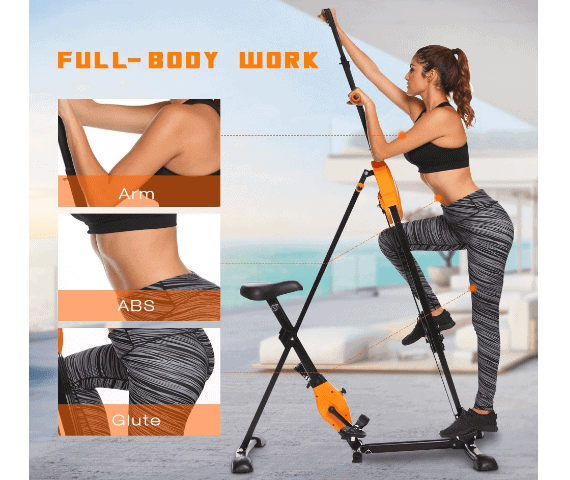 Overall, this is a good full body cardio workout machine that is affordable, handy and useful for toning the muscles groups and weight loss.